Where do people mention candidates on Twitter? | Can social data be used to predict elections? Where do people mention candidates on Twitter? In previous posts we’ve looked at people mentioning local party candidates on Twitter. In that post we basically assumed that people mentioning local candidates were based in the same constituency as the candidate themselves. But is that the case? 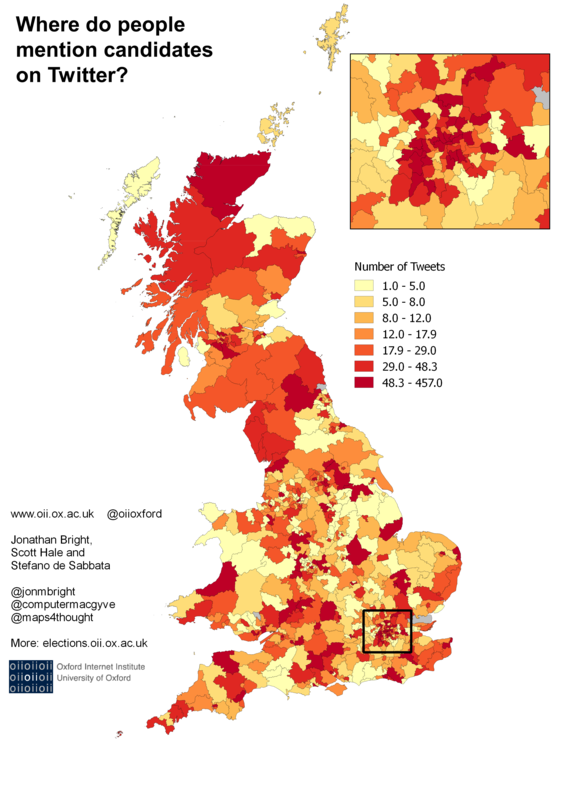 It could be that the majority of tweets are coming from large cities, especially London, where the majority of the party machines are typically based. To provide a rough check of this, we looked at all mentions of candidates on Twitter during the last month which had geolocation enabled (usually because they are tweeted through a smartphone). Geolocated tweets are a fraction of the overall tweets produced (less than 5%); nevertheless, they provide a rough and ready way of checking that all of our candidate tweets are not from one place. In short, candidate mentions are pretty evenly spread through the country (albeit based on a relatively small amount of data): there is no sense they are concentrated in one part of the country. This entry was posted in Analysis, Data and tagged campaigns, data, ge2015, oii, oiige15, twitter on May 12, 2015 by jonathanbright.